DIGITAL REALITY is already changing our world. But what’s coming next? Skim off knowledge and meet the most inspiring and advanced pioneers on Augmented, Virtual and Mixed Reality, 3D and CGI, Machine Learning and Artificial Intelligence. Top notch and international: Experience business optimizing best practices from various industry fields, receive latest insights from science and economic market drivers and exchange knowledge about software and hardware development at DIGILITY 2018. Join our call for speaker and share your projects and vision with us: https://www.digility.de/conference/call-for-speakers/. 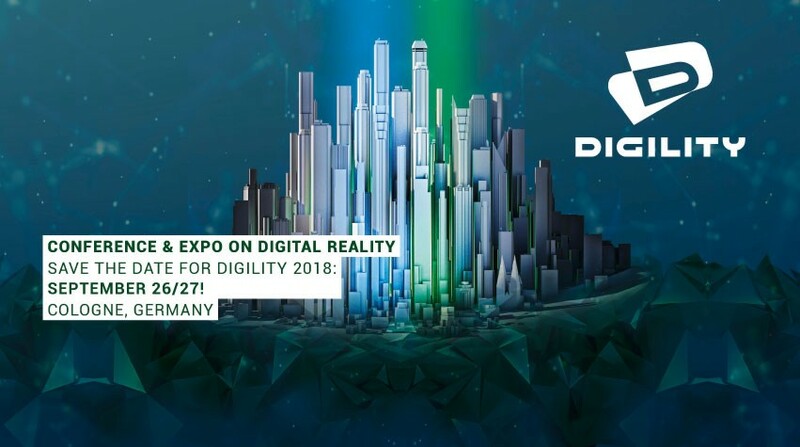 Become an exhibitor and meet new business opportunities in our huge expo space: https://www.digility.de/exposition/become-an-exhibitor/. SEE YOU IN THE CAPITAL OF DIGITAL REALITY: 26/27th of September in Cologne!